Just how difficult it can be to identify the original purpose of an early modern heraldic painting taken out of its original context is exemplified by a Dutch heraldic panel or wapenbord from the late sixteenth century (fig. 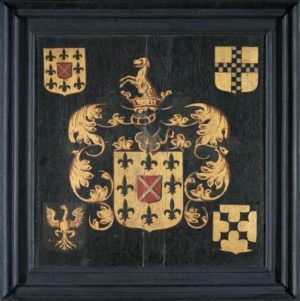 1) – was it commissioned to hang in a church as a rouwboard (mourning shield), or was it painted to document a marriage, birth, or any other important event in the family whose ancestral arms it depicts? Dated 1587, this wapenbord is painted on a single wood panel measuring 42 x 33.5 cm without its later frame. Painted against a dark green background framed in black, the large heraldic achievement in the centre belongs to the Van Harn family. It is surrounded by the Van Harn (upper left), Zosius (upper right), Lyster (lower left) and Vool (lower right) arms, which are identified by inscriptions. This composition implies that the wapenbord was commissioned for a scion of the Van Harn family whose paternal ancestors are represented by the arms on the left-hand (dexter) side of the panel with the maternal ones on the opposite (sinister) side. The Van Harn family originated from Rhenen in the province of Utrecht where Gerrit van Harn Jansz. (d. 1557) is recorded as mayor in 1540. His son Willem (c.1513-1580), who was mayor of Rhenen in 1557, married Catharina Henricsdr. 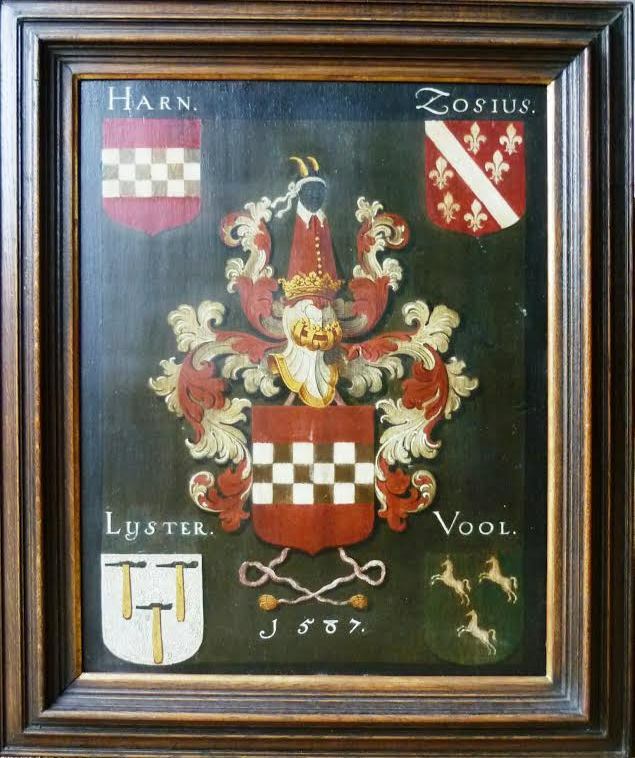 Lijsters (c.1518-1598), and it is their arms that are displayed on the paternal side on the wapenbord of 1587. Their son Dr Joost Willemsz. van Harn (c.1556-1602) was married twice, first to Aeltge Cornelisdr. van Zijl (d. 1580) in 1578, and secondly to Josina Hermans alias Zoes or Zosius (1559-1598) in 1583. 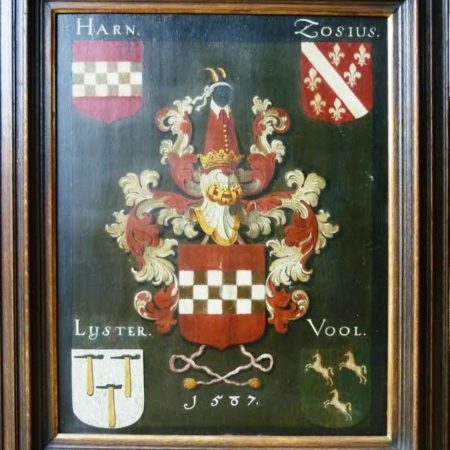 Josina was a daughter of Herman Joosten alias Zoes, a town councillor from nearby Amersfoort, and his wife Antonia Vool, whose arms are depicted on the maternal side. As the wapenbord lacks an inscription that clearly identifies the event it was meant to commemorate, the only clue apart from the heraldry that might help to determine its original purpose is the date inscribed on the panel. The fact that Joost van Harn was appointed as the Count of Culemborg’s personal physician in 1587 does not seem to explain the commissioning of the wapenbord, but the same year also saw the death of Joost and Josina’s second child Willem (born 1585), for whose burial at Culemborg the wapenbord may indeed have been painted. 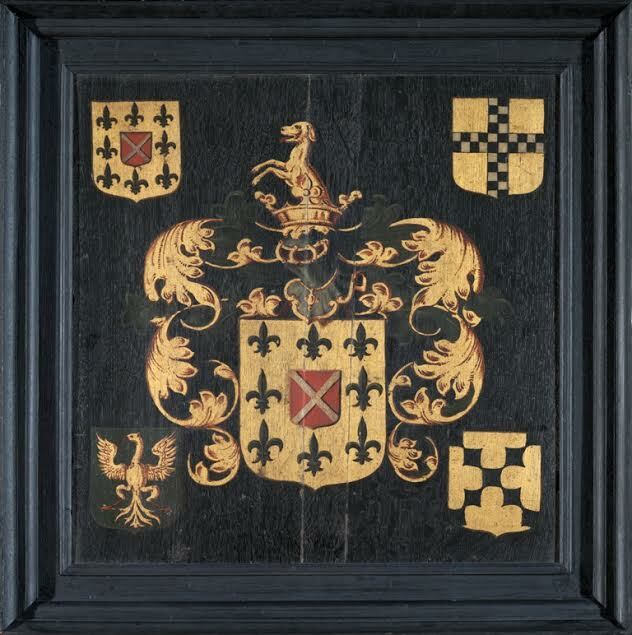 As the early provenance of the panel is unknown, it is impossible to say if it was produced to hang in the church where Willem was buried or if the family took it with them as a memento when they moved from Culemborg to Zwolle in 1589. If the wapenbord remained in the church, it was probably taken down and passed into private hands at the time of the Batavian Republic (1795-1806) when the use of heraldry was forbidden. This was almost certainly the fate of the very similar wapenbord of Floris van Jutphaes van Wijnstein, which was hung in the Grote of Sint Laurenskerk at Alkmaar after his death in 1644 (fig. 2). However, the case is not as straightforward as it seems, for there is another wapenbord of the Van Harn family that cannot be linked with a burial (fig. 3). Although smaller in size (30 x 27.5 cm), its overall composition is obviously based on the 1587 wapenbord, which it resembles down to the central Van Harn heraldic achievement and the painted black frame alongside the outer edge of the panel. 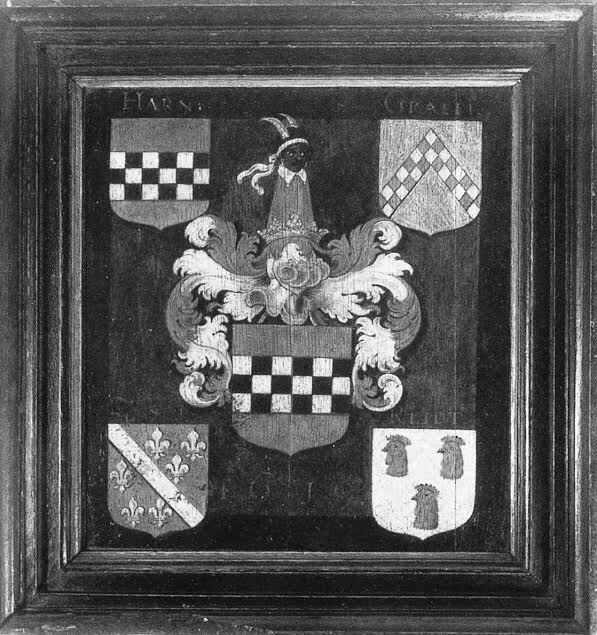 Dated 1619, it shows the arms of the Van Harn (upper left), Graeff (upper right), Zosius (lower left) and Reidt (lower right) families and therefore must commemorate an event in the lives of Willem van Harn and his wife Clara, daughter of Johan van de Graeff and Elisabeth van Reidt, or of one of their children. Willem (1591-1653), the younger brother and namesake of the above-mentioned son of Joost van Harn, married Clara in Arnhem on 31 January 1619, and their firstborn son Joost was baptised there a year later on 9 January 1620. Although it is tempting to speculate that Joost might have been born very late in 1619 and that the wapenbord could therefore have been painted to commemorate his birth, Otto Schutte is almost certainly right when he rejects this idea for the simple reason that at the time most children were baptized within a few days of their birth. Thus, if the year 1619 is indeed the original date and not the result of a faulty restoration, it has to follow that this wapenbord was probably commissioned to document Van Harn’s marriage even though the arrangement of the arms seems to suggest otherwise. These examples show that early modern wapenbord examples from the Netherlands need and deserve further study to distinguish between the various purposes they were commissioned for. I wish to thank Dr Sophie Oosterwijk for her kind comments on this note. Furthermore, I’d like to thank Marjolein de Boer, Stedelijk Museum Alkmaar, for the permission to reproduce Floris van Jutphaes van Wijnstein’s wapenbord, and Marijke Dijkers, Museum Arnhem, for trying to locate the Van Harn wapenbord of 1619. Otto Schutte: “Een wapenbordje uit de familie Van Harn”, De Nederlandsche Leeuw 118.1-2 (2001), 229-247. Wapenbord van kapitein jonkheer Floris van Jutphaes van Wijnestein (http://www.beeldbank-nh.nl/zoeken-in-de-beeldbank/task/detail?identifier=021881&provider_id=17; accessed 20 July 2015). Wapenbord dated 1587, unknown Dutch painter, panel 42 x 33.5 cm (private collection, Germany). Wapenbord (1644), unknown Dutch painter, panel 64 x 64 cm (Collection Stedelijk Museum Alkmaar, The Netherlands). Wapenbord dated 1619, unknown Dutch painter, panel 30 x 27.5 cm (present whereabouts unknown; formerly in the collection of the Historisch Museum het Burgerweeshuis, Arnhem, The Netherlands).